As a historical record, the icon for these were originally red. It was updated to green as of Cataclysm beta build 13277. Made glancing at mats easier. Blood maybe? Blood is life. See for yourself that Motes of Life or Crystallized Life don't have clouds they can be harvested from (anymore in the case of the Motes). This guy needs to quit asking the same question over all of the volatiles. How can you find gas clouds in cata when it hasn't even come out yet? Aww, was wondering how soon that would get fixed; seemed to easy to be true. As a Herbalist the best place for this is Hyjal, due to the environment(Grassy) and the chance of three different herbs spawning it makes for quick gathering. If your selling this on the AH, consider selling it in stacks of 15 so Alchemists can conveniently buy them for their Transmute: Living Elements. I usually put stacks of 15 up a slight premium to buying it in 20 stacks (or if you like, charge slightly less than a stack of 20 to catch out the unaware). where can u find volatile life? If your not an herbalist or skinner, don't plan on getting this other than AH or a friend, not dropped by any mob except the one in Halls of Origination. 30 of this items, along with 8 bolts of embersilk are needed to make Dream of Hyjal. At 10g a piece (on Arthas-US at least), expect to be selling a lot of the powerful spellthreads to pay for the Lifes every week. Unless you're a chinese farmer, then go ahead and buy them all. this is complete crap that blizz made these where you HAVE to either make a profession, or have to sell a kidney to get them. crap crap crap. I have a great spot for you. In Deatholme there is a daily called Soft Rock. For those people wanting to get in good with this faction it's one of 7 dailies available in that area. Now, the great thing about that is that you have huge numbers of people killing these monsters. The good news is that herbalists can skin them! When Cata first came live, I was disappointed to find out that skinning them only made them disappear. After doing that to a dozen or so, I just gave up. After the last patch, however, I did a skinning automatically and got 3 volatile life. I went "?". So I started flying in a circle, skinning the masses of the dead, and got about a 40% drop on he Volatile, and about a 10%+ drop on acquiring other herbs (some high end, some with the volatile life), and the rest of the time, some grey trash herb. As an alchemist, this meant that in a short time I had 15 volatile life to transmute, and I could do it as part of my daily (and as a master of alchemy, I sometimes got a double transmute!). So my recommendation is to go there, and be a vulture, swooping down on the dead to get what you need - volatile life! This works great for an herbalist who can skin, but what about those of us that cannot? Does anyone have any idea of how this can be aquired without going to the AH and paying the rediculous prices? "skinning" here likely means using herbalism to dispose of a looted corpse so you do _not_ need skinning to do it. Engineers kan dispose of (aka "skin") some mechanical mobs (not so much in Cata as in Northrend though) for engineering parts. Miners can dispose of some elementals (mainly earth elementals) for ores. Skinners can skin creatures (but seldom elementals or mechanical mobs) for, uh, skins and leather. Herbalists can dispose of nature elementals for various life essences and flowers. Of course, you could just do what herbalists normally do, pick herbs, and get volatile life in (at the time of this writing) droves. As an herbalist, I find I get tons of these off the herbs in lower level areas. Mount Hyjal cinderbloom seems to drop a lot more than Tol Barad cinderbloom for example. And I hardly get any from herbs in Twilight Highlands. Best place to farm volatile life: Deepholm. I start from the temple and go around Aeonaxx's path until i reach the northwestern end. There i abruptly keep going until i hit the place that gives has those big mushromms that u need to explode for a quest. 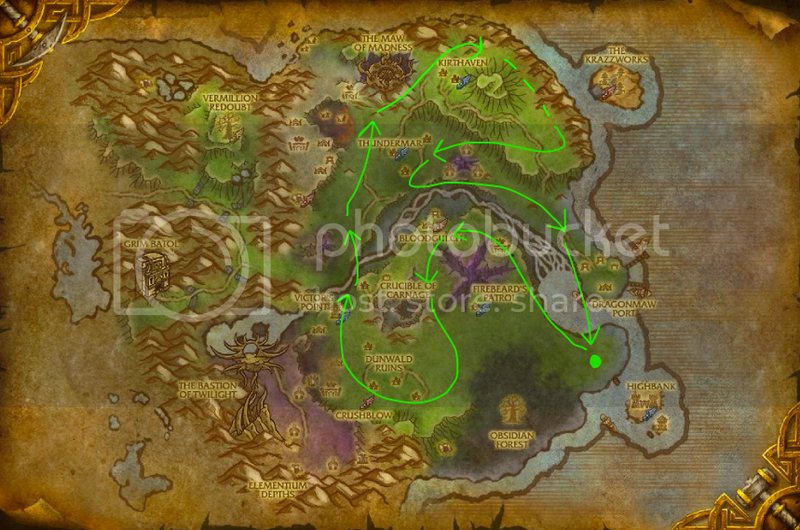 There are 10 billion herbs there and all over deepholm. If you go at it, u can farm up to 200 volatile life an hour (i find that generally i get about 125-175). Twilight Highlands: Volatile life to FIRE. Vash'jir: Volatile life to WATER (no surprise there). Any way to correct this totally misleading page? "Then I abruptly keep going"
These don't drop from Twilight Stalkers in Twilight Highlands anymore. I just went up there looking and after you kill the Stalker you can't loot it, so we can cross that one off the list too. Volatile life is'nt able to be looted off of Mac Toads as stated. They are a level 1 critter and unlootable. The wowhead client, in one technical way or another, reads the drop as the items received with the npc clicked. If, for example, a mac toad was killed (and still selected) while a volatile life was looted from a plant, it would count as a drop from the mac toad. The misleading drop page isn't a matter of user input trying to mislead you, but instead just an unfortunate bug in the way that drops are tracked. In the cases where there's several loots of the item shown (Riverbed crocolisk, for example), it's simply a matter of that monster spawning on or near an herb that gives the volatile life. When a person with the client kills the mob to loot the herb, it's not uncommon that the mob is selected when the loot appears and then the incorrect data is displayed. When I checked the droprate on volatile life from these Fungal Bemoths i was surprised. It's only a 11% dropchance of volatile life. Ilangevi said - I have a great spot for you. In Deatholme there is a daily called Soft Rock. For those people wanting to get in good with this faction it's one of 7 dailies available in that area. Now, the great thing about that is that you have huge numbers of people killing these monsters. (Sorry I had to quote that way, I cant figure out how to do it the right way). Either you are just totally incorrect, or they changed it. I spent an hour farming (and herb-skinning, yes I am an herbalist), the Fungal Behemoths, and didn't get ONE SINGLE Violatile Life. Not Deatholme..it's Deepholm. Taken from wowwiki: Deatholme is a Scourge citadel in the southwestern Ghostlands, marking the beginning of the Dead Scar. It is the major headquarters of the Scourge in Quel'Thalas, on the other side of the hills from the Scourge capital of Stratholme in the Eastern Plaguelands. It is crawling with level 18-20 undead. So you won't find any Volatile Life there. So the only use for these is to get an alchemist to trasmute them into something more useful? OK~ I just read through these comments... and unless I'm missing something here, the verdict is that there's NO WAY to farm these if you're not an herbalist? Sometimes while skinning in Vashj'ir i got the "Strange Bloated Stomach" and a couple of them had the vol life in them. I find this easy to farm in Uldum. I don't really think anyone cares if someone slightly mispelled one word, in a lengthy and informative post. I have mispelled it the exact same way. Something about the second syllable of the word makes me want to put an "e" on the end of it. For the record, there were clouds in Wrath of the Lich King as well (although there were only a few). I just picked 10 Whiptail nodes in Uldum and there wasn't a single Volatile Life nor any other additional item such as lifegiving seeds - there was just Whiptail, and that was it. But Cinderbloom and Stormvine on Hyjal are both still dropping them (volatile life and lifegiving seeds), although I haven't picked enough to check the drop rates. I just picked up 62 Volatile Life during a 40-minute run on Hyjal. It dropped often from Cinderbloom and Stormvine, but not at all from Azshara's Veil. I found it easy as an herbalist to fly around Twilight Highlands and gather a lot Volatile Life from the Twilight Jasmine (at least 1 Volatile Life per 2 Twilight Jasmine). You can sell both the Twilight Jasmine and Volatile Life at a high price in the AH. Great combination. Sold them all for a very decent price and there are plenty of nodes which quickly respawn. Unfortunately, this is the only elemental type that cannot be placed in an Engineer's Toolbox. All other motes/crystalized/volatiles can be, however. So one can have Mote/Primal/Crystalized life, but not a volatile life within one's toolbox. Makes it tough for those of us who like things... just a certain way. Neat and organized. Curse you blizz! Just read on the guide to volatile air and they told about Florawing Hive Queen in Zul'Gurub (left when you enter the instance). Seems the honeycomb she drops has volatile life in it as well, 3-6 every drop(100% rate of drop). As a non herbalist, or even as one, this seems really fast. Run in, kill her, run out reset instance and repeat. At the time of typing, i've done this for 5 minutes(perhaps less) and netted over 20 air and 20 life. The 10 run limit will come up quick, but still. Quick edit: ran until got locked out, 53 life, 53 air, 47 twilight jasmine. no herbalism required and you get about 50 volatile life in about 7 minutes. The best and most efficient way I've found to farm Volatile Life is to go to Zul'Gurub and kill Florawing Hive Queen. You can find her at the beginning of the instance... once you enter, go all the way down those stone steps and immediately turn LEFT. Keep going about 50 yards and you will see her hovering above a pond. Now that you can do 10 instances in an hour, I go do this on my rogue and just park her outside the instance for an hour until the restriction has expired. From start to finish, it takes me less than 10 minutes to do all 10 kills/resets. What you want off the Hive Queen is Hive Queen's Honeycomb, which drops almost everytime (98% chance). I must have killed her at least 200+ times already, and only ONCE she didn't drop Hive Queen's Honeycomb. The bonus of farming Volatile Life this way is that you will also be getting other mats at the same time, all of which are contained in Hive Queen's Honeycomb! I usually get about 45-55 Volatile Life AND Volatile Air per 10 kills, so it will take you less than 30 min (not counting the 1 hr downtimes in between) to get enough to make Vial of the Sands, which I make fairly often for guild mount raffles... so if you are looking to make the same item, this is a great way to do it! You will also get Twilight Jasmine from the Honeycomb, and I ususally get about 45-55 of those every 10 kills as well. P.S. If you are trying to make Vial of the Sands, you will need 120 Volatile Air, but you also need a little more Volatile Life (128 specifically) for the flasks required in that recipe. But, you should get enough Volatile Life within those 30 kills because the Hive Queen's Honeycomb is supposed to drop about as much Life as Air (4-6 of each). If you are intending to farm the mats for this mount yourself, and are going to pick the herbs required (Azshara's Veil x64, Whiptail x128, and Cinderbloom x64), you also have a 39% per Wowhead to obtain Volatile Life from picking any of those 3 herbs... although I'm not sure how much each time... it's probably a range of 1-3 Life if it appears with any of those herbs while gathering (should have paid closer attention!). And remember... if you have an alchemist make the flasks required for this recipe (Flask of Titanic Strength x8 and Flask of the Winds x8) instead of buying them off the AH, you will likely get *at least* 1 proc per type of flask (since you are making 8 of each), and end up with even more flasks than needed... so if you are short a few herbs, don't worry! Zul'Gurub has a decent way of not only getting life, but also air and earth. There are two elites mini-bosses you can kill that drop volatiles every time, then reset instances, and do it over and over until you hit the hourly limit. As of 8.0 the Florawing Hive Queen only drops a honeycomb on the first kill of the day so this is no longer as viable a farming method. Ok if you haven't played this game in forever or you just don't remember anything maybe this will help you out.